Background: Apoptotic index (AI) using light microscopy as an indirect measure to assess the significance of apoptosis as a proliferative marker in dysplastic lesions and malignant epithelial lesions of the oral cavity. Aims: (1) To quantify the apoptotic bodies/cells in oral epithelial dysplastic (OED) lesions and oral squamous cell carcinoma (OSCC). (2) To measure AI in OED and OSCC. (3) To compare AI in OED and OSCC. 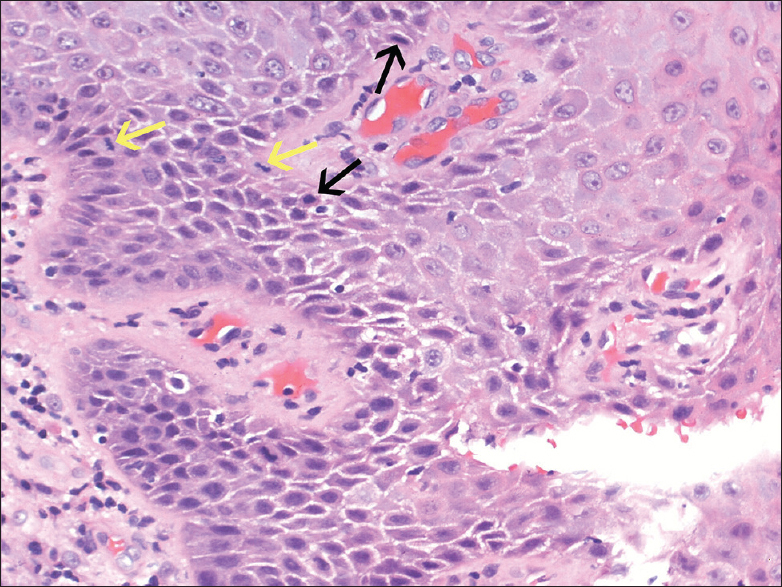 Settings and Design: The proposed laboratory-based retrospective study involved the use of hematoxylin and eosin (H and E)-stained slides of previously diagnosed OED lesions and OSCC from institutional archives. Materials and Methods: This study constituted 50 cases, each of H and E-stained slides of previously diagnosed cases of OED and OSCC. AI was calculated as the number of apoptotic bodies/cells expressed as a percentage of the total number of nonapoptotic tumor/dysplastic cells counted in each case. Statistical Analysis Used: Nonparametric tests such as Kruskal–Wallis test and Mann–Whitney test were used. Results: There was a statistically significant increase in AI from OED to OSCC (P = 0.000). Conclusions: Further studies need to be undertaken to detect and understand the apoptotic mechanisms in the progression from OED to OSCC. Oral cancers are a major health problem in India. Carcinogenesis is a multistep process of genetic mutations that can be preceded by potentially malignant lesions that culminate in tumor formation and ultimately invasion and metastasis. Early diagnosis greatly increases the probability of cure, with minimum impairment and deformity. Diagnosis of cancer histopathologically is an important aspect as it is considered the gold standard. Apoptosis is a form of programmed cell death. Apoptosis can be quantified in an attempt to understand the balance of cell proliferation or death in a particular physiologic or pathologic process., Apoptosis is seen to increase with increasing grades of dysplasia and cancer. Hence, quantifying apoptosis can help us identify the tumor aggressiveness. The percentage of apoptotic bodies in the tumor cells and dysplastic cells is designated as an apoptotic index (AI). This study aims at evaluating AI using light microscopy as an indirect measure to assess the significance of AI as a prognostic marker in dysplastic lesions and malignant epithelial lesions of the oral cavity. This study constituted 50 cases each of hematoxylin and eosin (H and E)-stained slides of previously diagnosed cases of oral epithelial dysplasia (OED) and OSCC. Only cases confirmed histopathologically with complete patient record were taken for the study. Cases with recurrence of carcinoma were excluded from the study. Cases where patients have undergone chemotherapy and radiotherapy and folded tissue sections where individual cells cannot be properly identified and necrotic cases were also excluded from the study. In the study sample, in each section, 1000 dysplastic cells/tumor cells were evaluated for the presence of apoptotic bodies/cells in ×40 magnification. A particular area was selected in the slide; a total number of epithelial cells were first counted and noted. Then, the number of apoptotic cells in that particular area was also counted. Then, the field was changed and apoptotic bodies were counted in that particular area. Thus, in a given slide, apoptotic bodies present within the total of 1000 cells were counted. AI was calculated as the number of apoptotic bodies/cells expressed as a percentage of the total number of nonapoptotic tumor/dysplastic cells counted in each case. Morphologically, apoptosis is characterized by a series of morphological changes, which can be appreciated by light microscopy. 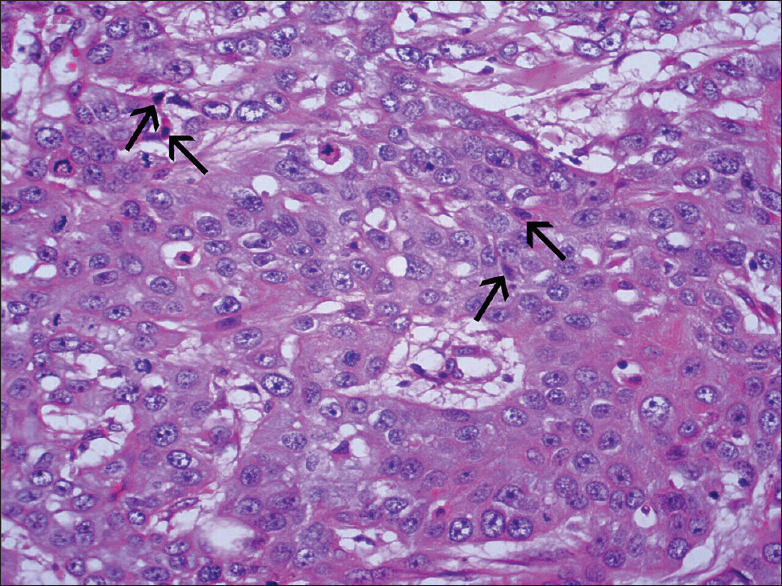 On histologic examination with H and E stain, apoptosis involves single cells or small clusters of cells. The apoptotic cell appears as a round or oval mass with dark eosinophilic cytoplasm and dense purple nuclear chromatin fragments. Nuclei show various stages of chromatin condensation and aggregation and, ultimately, karyorrhexis. In OED, apoptotic cells/bodies were seen distributed in basal and spinous layer of the epithelium, and for oral squamous cell carcinoma (OSCC) cases, apoptosis was assessed in the tumor islands in the invasive front [Figure 1] and [Figure 2]. Statistical evaluation was carried out using reliability analysis for interobserver bias, nonparametric tests such as Kruskal–Wallis test and Mann–Whitney test for comparison of AI between OED and OSCC study groups. In this study, all the study samples were observed by two observers. The counting of AI was done independently to reduce the observer bias. Reliability analysis was done to test the consistency between the two observers. Since no interobserver bias was observed between the values of the two observers, the values of the first observer was taken for analysis. 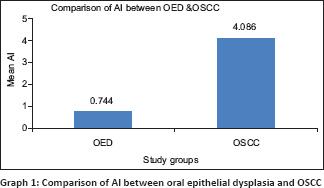 Statistically significant difference was observed in values of AI between the OED and OSCC study groups. Here P = 0.000. Since P < 0.005, this study is statistically significant [Table 1] and [Graph 1]. Individuals with primary dysplastic lesions in the oral cavity are at risk for developing OSCC. A large number of stimuli can induce apoptosis in a cell type-dependent manner. Depending on the triggering factor and the cell type, there are multiple signaling pathways that lead to activation of the apoptotic machinery. Change in the control of apoptosis is a critical step in the development of invasive change in a premalignant tissue. This study was conducted to compare the AI in OED and OSCC using H and E-stained slides to determine whether apoptosis can be used as a prognostic marker. H and E-stained slides give fairly reliable results and are an inexpensive method for detection of apoptotic cells, hence used in this study. Our study showed that statistically significant difference was observed between OED and OSCC study groups. The observed increase in apoptosis from dysplasia to OSCC suggests a mechanism, whereby apoptosis helps to eliminate cells that have been produced in excess, that have developed improperly, undergone abnormal mitosis, or sustained genetic damage. Chromosomal aberrations and accumulation of mutations in many genes encoding crucial proteins or oncoproteins that control cell growth and apoptosis may also induce neoplastic transformation. Analysis of AI showed a progressive increase in apoptosis in parallel with biological aggressiveness, indicating increased synthetic activity of these proteins during neoplastic progression. As the tumor grows, there is increase in cell proliferation, and probably, due to the large tumor size and high growth rate potential, the tumor outgrows its blood supply leading to hypoxic injury-causing increased apoptosis. Increased apoptosis with increasing grades of neoplastic lesions is associated with large tumor size and with a shortened disease-free survival period. Compelling evidence indicates that oncogenic changes promote apoptosis during multistage carcinogenesis. We have seen in this study that apoptosis can be used as a prognostic marker in OED lesions and OSCC. Further studies need to be undertaken using better methods of detection of apoptosis to detect and understand the apoptotic mechanisms in the progression from OED to OSCC. This would in turn help in the development of anticancer therapies utilizing apoptosis as a target for the drugs. Kumar V, Robbins SL and Cotran RS “Pathologic Basis of Disease”. 7th ed. Philadelphia: Saunders; 2003. Saini R, Saini S, Sharma S. Oral biopsy: A dental gawk. J Surg Tech Case Rep 2010;2:93. Nafarzadeh S, Jafari S, Bijani A. Assessment of bax and bcl-2 immunoexpression in patients with oral lichen planus and oral squamous cell carcinoma. Int J Mol Cell Med 2013;2:136-42. Garrity MM, Burgart LJ, Riehle DL, Hill EM, Sebo TJ, Witzig T. Identifying and quantifying apoptosis: Navigating technical pitfalls. Mod Pathol 2003;16:389-94. Archana M, Bastian, Yogesh TL, Kumaraswamy KL. Various methods available for detection of apoptotic cells – A review. Indian J Cancer 2013;50:274-83. Kasibhatla S, Tseng B. Why target apoptosis in cancer treatment? Mol Cancer Ther 2003;2:573-80. Soini Y, Pääkkö P, Lehto VP. Histopathological evaluation of apoptosis in cancer. Am J Pathol 1998;153:1041-53. Mysorekar VV, David S, Rao SG. Proliferative and apoptotic indices in squamous epithelial lesions of the cervix. Bahrain Med Bull 2008;30:1-6. Jain A, Maheshwari V, Alam K, Mehdi G, Sharma SC. Apoptosis in premalignant and malignant squamous cell lesions of the oral cavity: A light microscopic study. Indian J Pathol Microbiol 2009;52:164-6.